The Tanjong Katong neighbourhood is one with cafes and eateries spouting out relatively fast. Coupled with old school eateries and stalls, it’s an eclectic neighbourhood with a wide range of food options. With its large residential crowd and people flocking from all parts of Singapore, it is undoubtedly a prime spot for cafe owners and eateries. Well, the East has practically everything for food! Yes, we East siders do take our food very seriously. 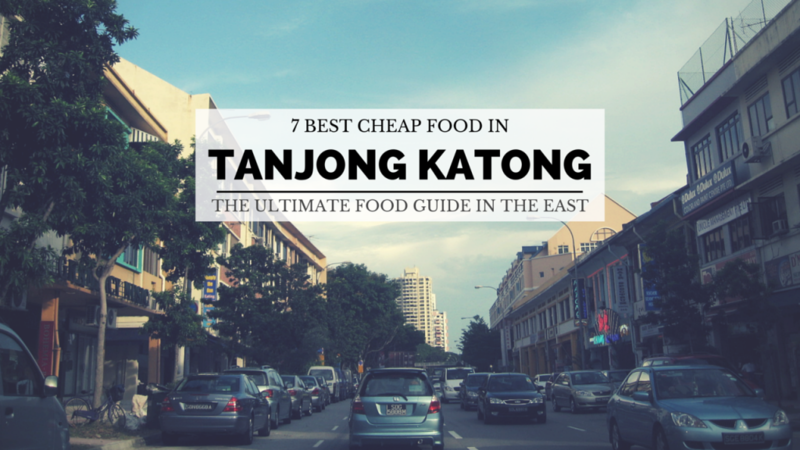 Do join us for a gastronomic tour down Tanjong Katong Road as bring you 7 best cheap eats all under $15. Don’t be fooled by its name. Although this stall is named Punggol Nasi Lemak, it is located along Tanjong Katong Road. Though it is priced slightly highly than your usual plate of Nasi Lemak, you get to choose from a wide array of dishes. What we recommend – their crispy chicken wings fried to perfection, crunchy on the outside and juicy on the inside; and their spicy Otah. Their French Beans fried with dried shrimps is also one of our must haves. For any Nasi Lemak dish, the sambal chilli is the most important condiment and we must say it is on point. The queue starts as early as 6pm. Fret not, as their staff work quickly and it won’t take too long before it’s your turn (about 15 minutes). Each plate will cost from about $5 to $7 depending on what dishes you pick. Overall, its fried chicken wings and otahs undoubtedly win our hearts. Eng’s Noodles House serve up some really good wanton mee. This place has come a long way from the 1950s where it started out from a pushcart at Duku Road to a stall at Dunman Food Center and now a shophouse unit along Tanjong Katong Road. Their noodles are custom made according to Eng’s specifications. Thicker than the usual wanton noodles, they’re springy and firm. Bottles of hot chilli sauce are also provided at each table. Their wontons, though smaller in size, are seriously addictive. Priced at $4.50 for a small bowl of wanton mee and $5.50 for a large one. Tip: Order an extra plate of wonton (we prefer the non-fried version), you won’t regret it! Known as LICK in short, this homely ice cream palour is opened by a pair of sisters-in-law. Serving up 30 flavours ranging from the good old classics, zesty fruity flavours to local delights, this is the place to go for a late night ice cream fix! Some of their best sellers include Gula Melaka, Sea Salt Caramel, and Mao Shan Wang. This place also makes really good crispy waffles which are fluffy and soft on the inside. The cafe is quite small and it is difficult to get a seat on weekends as it is usually crowded. $3.30 for a single scoop, $5.30 for double scoop and approximately $10 for 2 scoops of ice cream and waffles. Tip: Half-price for waffles every Tuesday. Free Wi-Fi available. If you’re looking for affordable and good Thai food, check out Maekhong Thai Cuisine. With over 100 dishes on the menu, Chef Kuan and his team cook for the Singaporean’s tastebuds while retaining the authenticity of each dish. Try their Basil Seafood Fried Rice (pictured above) at $6.80 nett. A very affordable price for big pieces of squid, sliced fish and prawns. Their Pineapple Rice ($6.80) with lap cheong (chinese port sausage) is delectable to say the least. For the sweet tooth, order their Red Ruby or Mango Sticky Rice for the perfect end to a great meal. Nan Xiang Chicken Rice is the stall to visit if you are looking for some good chicken rice at Tanjong Katong. Located in a coffee shop along Tanjong Katong Road, this stall not only serves chicken rice but also the best char siew (cantonese roasted meat), roasted to perfection! Its char siew is done old school style – charred with fatty cuts. They also serve good roast duck and sio bak (crispy roast pork belly). With quality food at affordable prices, this stall often gets crowded during meal times but it is well worth the waiting time for a good plate of chicken rice and char siew. A plate of chicken rice or char siew rice starts from $3. Located at a laneway (at Boscombe Road) off the busy Tanjong Katong Road lies a cosy cafe where people come together to enjoy good food. Serving up casual breakfasts to dinner mains, with speciality coffee and in-house baked pastries to go along, this cafe presents a welcoming atmosphere for its customers. If you’d like to enjoy a chill out evening, drop by The Laneway Market. Its coffee, tea and desserts are decent with no extra GST or service charge. The cafe also provides free Wi-Fi and iced water. You can spend almost the whole day in the comforts of the cafe catching up with friends or work. For the coffee lovers, try their Laneway Cuppa ($6), a special blend of Sumatran and Ethiopian beans infused with a shot of coconut essence. Their Earl Grey latte ($6) and cold brewed coffee are worthy of mention too. For the mains, we recommend their Laneway Carbonara – Bacon, Chipolatas, Sous Vide Egg ($15). Whats more – download the Hollerout app and receive 10% discount with $40 min spent (code: DISCOVERSG). Looking for a breakfast spot to start your day right or some desserts after your meal? Check out Do.Main Bakery. They are commited to using authentic production techniques and quality ingredients in baking. Do.Main Bakery is a brainchild of Chef Frederic Deshayes, a French pastry chef who apprenticed at Lenôtre Paris. He opened the first Lenôtre boutique in Seoul and worked with Pierre Hermé and Christophe Michalak in Plaza Athénée. Not only do they have sweet bakes, but they also have savoury items on the menu too. Their rich and creamy Mac and Cheese ($14) featuring baked ravioli with comte cheese, and the Red Wine Oxtail Stew Pie ($12) are scrumptious . Its crust is buttery and flaky and isn’t too oily. Check out their full menu here. With so much good and cheap food along Tanjong Katong Road, there’s no reason to procrastinate. Head down soon to explore the place! For those driving to Tanjong Katong, parking may be difficult to find along the main road, but there is a big public carpark if you turn into the road just beside Caltex. If you know of any other affordable must eats at Tanjong Katong, do drop us a comment and let us know!